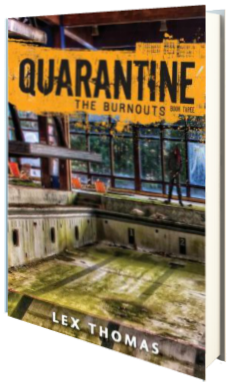 From Goodreads: Lord of the Flies in a 21st-century high school setting.Welcome to Quarantine 3: The Burnouts , where readers of The Maze Runner, Gone, and Divergent go when they’re hungry for more dark, compelling survival stories. When an explosion rocks David and Will’s suburban high school one morning, a deadly virus is unleashed on the school. After a year of quarantine, with no adults around, the students have created their own society. All of the social cliques have developed into gangs-The Nerds, The Geeks, The Freaks, The Sluts, The Skaters, The Burnouts, The Pretty Ones, and The Varsity-and each gang provides a service with which they can barter for provisions. Without a gang, it’s almost impossible to secure food, water, territory, or supplies. In the final installment in the Quarantine trilogy, the brothers are reunited on the Outside and it appears as if, for once everything is going right. But inside the school, Lucy is alone with no gang and no hope, until the Burnouts welcome her into their filthy arms. This is a series that, though gruesome and not for the faint of heart, I have thoroughly enjoyed. The characters are realistic, and over the course of three novels, we’ve really gotten to know them—all of them, both the good and bad. The novels have perfectly built on one another, and though they made my cringe more often than not, I can see events like this unfolding in any high school, mine included, should students be cut off from the adult world and locked in a school for years due to a deadly virus. And it’s scary, but Thomas does an amazing job portraying events. But while I really, really liked this third installment, I’m less than pleased with the entire ending. Truthfully, as I received an ARC from Netgalley, I’ve been wondering if perhaps I received an unfinished copy, doubtful as that is, but the hope remains the same as Thomas just sort of leaves readers hanging with a rather strange sentence. It took me unawares. As I’ve said, the novel itself is extremely well done, as are the two novels that come before it, The Loners and The Saints. I love David, and always have, and I’m glad he’s back in the picture in this novel. His good sense helps drive the plot, though he’s definitely in over his head in this one. Will has a tendency to get on my last nerve, but I love him anyway, and Lucy’s story made my heart bleed. I knew Thomas’ style certainly wouldn’t let these three main characters finally get out of the school and go unscathed, but, like, whoa. What Thomas does to them isn’t nice… not one bit, and a piece of my heart sort of died with this particular event. And, while I could see the other big revelation coming a mile away, it was still jarring when it occurred, and, true to Thomas’ style, filled me with horror. I sort of feel like it couldn’t have come about any other way—no clean breaks would have fit the story, but… I had to read it twice to really believe that Thomas has done it. But all that aside, it’s the epilogue that really stuns me. It jumps time, barely explains anything, and ends with a hanging sentence, as I mentioned, that just leaves the reader unsatisfied. Perhaps there will be a novella conclusion later—that would be nice. Four stars. EgmontUSA has been extremely gracious in allowing me to read an ARC of this novel, via Netgalley, prior to its release today.